I searched the interwebs for some mp3s for all of you but came up empty handed. 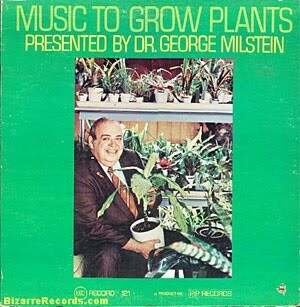 Somehow I imagine the music isn’t that interesting, but I’m not a plant so how would I know? Read the rest of the back cover here. nice! Only $115 for the LP! Yeah, a little spendy for some easy listening music with high frequency tones! Wow–thanks Amy! A little more groovin’ than I expected. Apparently plants like peppy late 60s orchestral arrangements. Oooh moogs and plants. What a great idea. Will have to do another post on that! Many thanks. Avi–you rock (and, in this case, you rock the plants too). Yeah, we’re going to need some research funds for this. I’m thinking of a network of sound isolated greenhouses each with it’s own music pumped in–Stevie Nicks, Metallica, 60s Moog albums, Lady Gaga etc. Extra pay for the researchers assigned to that Lady Gaga greenhouse. Would you believe we used to have this LP? I got it for $1, I think, at a sidewalk sale. I think my mom actually liked it and found it relaxing. I’m so pleased you posted this!